With enriched industrial experience and knowledge, we are providing an excellent range of Non Woven D Cut Bags that are highly acknowledged in the market for its high strength and light weight. 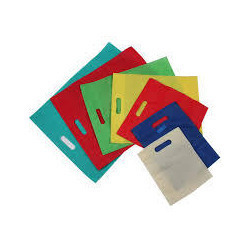 Our offered D cut bag is available with varied specifications like shapes, designs and sizes. Under the supervision of our skilled professionals, this D cut bag is designed using the finest quality basic material and modern techniques. Established in the year 2008, in Tirupati (Andhra Pradesh, India), We “Srivari Industries”, are recognized as the prominent manufacturer, exporter and supplier of Non Woven Fabric, Packaging Bags, HDPE And PP Plastic Bottles, Nonwoven Bag, Fabric Rolls And Sheets, Agricultural Crop Covers, mulching mats. Ours is a Partnership Firm. Our organization is supervised under the guidance of “K. Rajendra Chetty”. We export our products to Sri Lanka, Middle East etc.